At an average age of 23, men from across the state, including the Albemarle region, began volunteering for the Confederate Army in 1861 with some soldiers resigning from the United States Army to serve in the Confederate Army. Regiments organized at county courthouses with companies often comprised of men from local neighborhoods. Taken from a letter written by Captain John B. Fearing to his wife Emily regarding the fighting at Fort Hatteras. Colonel Henry M. Shaw, Eighth Regiment North Carolina State Troops, February 1862. Confederate Colonel C.F. Henningsen’s statement regarding the burning of Elizabeth City in February 1862. 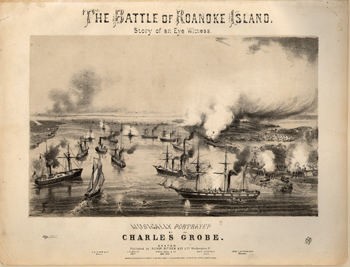 On August 28, 1861, the Union Navy bombarded Forts Clark and Hatteras, key defenses for the Albemarle and Pamlico Sounds and used by Confederate forces as bases of operation for their blockade-runners. With the arrival of 7,500 Union troops and 100 vessels at Roanoke Island on February 7, 1862, Confederate troops were forced to surrender, giving control to the Union. On February 10, the Confederate Navy’s Mosquito Fleet was destroyed during the Battle of Elizabeth City, leaving the city undefended. Union troops then headed to Edenton and occupied the town for several hours. Later in the month, Union forces shelled the town of Winton. Fearing the Confederacy’s use of the Dismal Swamp canal locks to transport goods and vessels, Union troops set out to destroy them. The Battle of South Mills was fought April 19, 1862.